After putting in my TPE stator, I wanted to make sure the charging system was as good as it could be. I was getting 14.9 @ idle, downwards to 14.3 @ 5k RPM with the stock style R/R. Not bad numbers, but I wanted a MOSFET. I grabbed a used one off a ZX-14 for $40 shipped off eBay, got the wiring needed, and waited. It all came in today, so I threw it on. Super easy installation, totally bypassed the stock wiring harness, and wired up the headlight relay. I had a friend solder everything up nice for me. I am getting 14.6v @ idle, and 14.6v @ 4k. Stable numbers. It's ready for a cruise tomorrow. 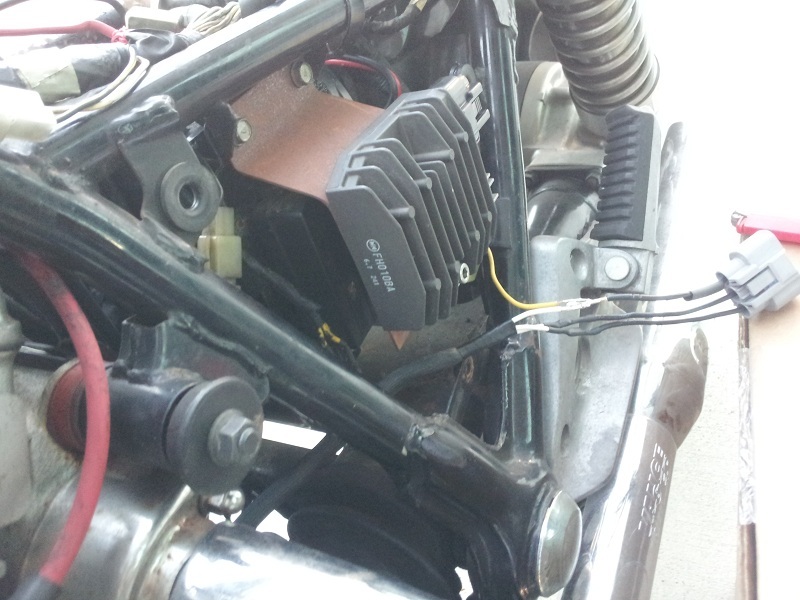 Showing the R/R (FH010BA), stator wires, and headlight trigger relay wire. Soldering all done. Showing the headlight trigger relay and some lovely heat-shrink. Last edited by thtanner; 06-09-2012 at 02:31 AM. the reason we were using the FH012AA was because its a universal R/R, and came with an install kit. I am fairly certain the FH012AA was never billed as universal from the factory. It appears one or two individuals put together kits from this R/R, and sold them as universal. Nothing from Shindengen hints that it is a universal regulator. The price that they were being sold for was actually fair, as the kit was 129, and the regulator is 139 from RonAyers/CheapCycleParts direct from Kawa. If you spend some time on eBay you can probably save some of that. My kit ended up costing around $86 installed. Just leaving these notes for anyone who is seeking info on MOSFET regulators in the future. Edit: I am reaching out to Shindengen's division that produces these regulators to see if I can get data sheets for each of them. A few people tried to reach out to Shindengen America with no luck (said the American side had no information on them), but I am going strait to the appropriate division. Japanese companies are usually very diligent with providing data sheets and technical specifications, so I am hopeful to receive a response. Last edited by thtanner; 06-09-2012 at 12:13 PM. you won't get any luck with Shindegen Japan either... they will only talk to MC Manufacturers. (I have emailed them several times) as for the FH012AA being a universal.. you are correct... its not it was for a Yamaha sports bike... but then again, there isn't such a thing as a universal R/R other than Electrosprt's universal which only works with an electromagnetic stator rotor, not he permanent magnet rotors we use. For my setup, I actually bypassed the existing wiring harness completely. It remains intact, but unused. 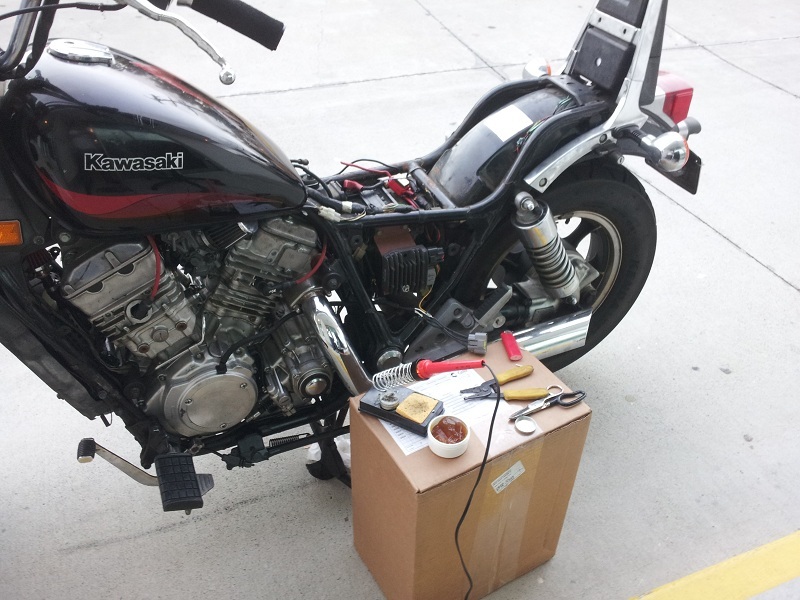 The stock wiring is quite small, and with my bike, quite aged, so I felt it was best to bypass the stock wiring completely to eliminate as much resistance and loss as possible. 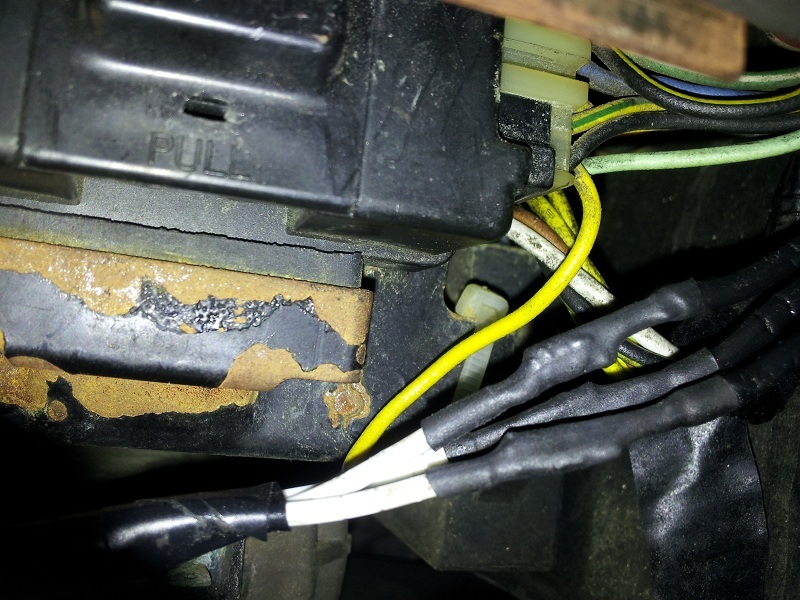 I have the R/R going directly to the battery, with a (sometimes mentioned as unneeded with AGM batteries) 30A self-resetting fuse on the positive lead. The stator wires go direct from the new stator to the R/R. The only thing that I had to modify from stock is spice the yellow wire from the junction box to one of the stator legs for the headlight relay. I chose to cut it and splice it in directly for cleanliness. If you think your bike's wiring harness is up to snuff, then that would be slick, easy-to-use, and a clean looking alternative. I just wanted to take my stock wiring out of the equation entirely. A nice neaty and tidy mod, I shall be copying this one. looks like a tidy install.....I like that it gets hidden behind the side cover.